Upon the closing of the M&T Bank, Columbia branch, in June 2010, bank officers contacted the Columbia Historical Preservation Society and allowed them to search the basement area for items and records relating to the banking history of the citizens of Columbia. 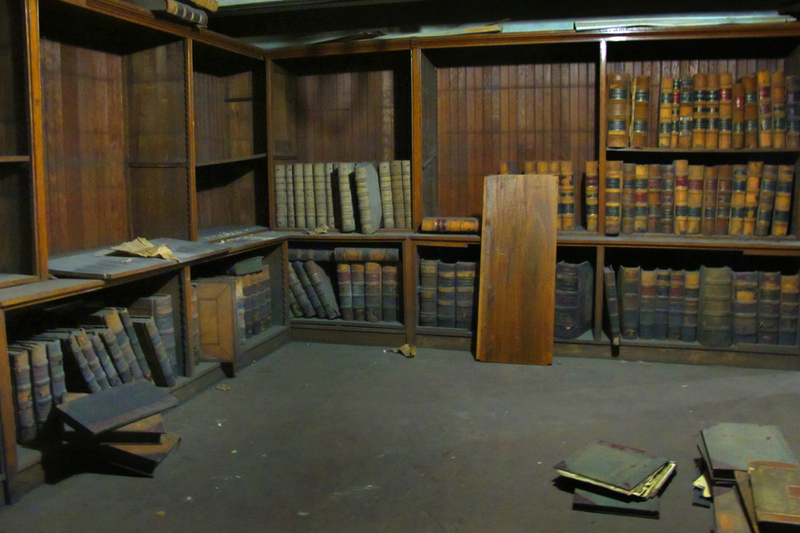 Little did they know of the treasures they would find: Over 700 leather-bound ledgers, letters, and booklets, most dating from the 1800‘s. Letters from prominent Pennsylvania citizens and everyday transactions from local citizens. Priceless treasures that peaked the imagination. The penmanship alone held a fascinating beauty. The Society is forever grateful to M&T Bank for the history they’ve shared with its citizens. One of the more interesting finds was a treasure trove of records from the Columbia Bank and Bridge Company that was incorporated in 1812. [The original charters and stocks for the company are in the Society’s possession and date back to 1814.] This company built the first bridge here, in 1814, spanning the Susquehanna (but was eventually destroyed by a flood). The second bridge was built in 1832 and was burned. The Columbia Bank and Bridge Company held meetings up until 1856 and had little recorded activity thereafter until 1864—when the most famous bridge burning took place on June 1863, marking a major turning point in the Civil War. In 1868, a replacement bridge was built, but was destroyed by a hurricane in 1896. Among other records discovered were original letters of deposition from two citizens of Columbia— Robert Crane and John Q. Denny. The letters recounted incidents of the day the bridge was burned to prevent Confederate troops from crossing into Columbia, June 28, 1863. The involvement of each man was told under oath in the presence of the local Justice of the Peace. Because the bridge was owned by Columbia Bank and Bridge Company, these depositions were necessary to be compensated on the government’s involvement of the destruction of the bridge. These letters provide insight into Columbia’s role during the Gettysburg Campaign of the Civil War. The bridge was burned by Columbia residents, and the Pennsylvania state militia, to stop the Confederate soldiers of Northern Virginia from entering Lancaster County. General Lee had hoped to invade Harrisburg from the rear and move eastward to Lancaster and Philadelphia in order to destroy railroad yards and other key industries. Union forces under the command of Colonel Jacob. G. Frick and Major Granville O. Haller were forced to burn the bridge, thereby blocking the route to Lancaster and Harrisburg. Confederate troops were forced to withdraw to Gettysburg to regroup with General Lee. If the bridge had not been burned the armies would never have met at Gettysburg where the battle was fought and the course of the Civil War was determined. I believe my ancestors were involved with the Columbia Bank and Bridge Co. as they were involved with several things there. Is there an index of surnames found in these records anywhere? I am mostly interested in surnames: Odell, Tyson, Simpson, Ellis, Crissinger. This gentleman listed below was my great-grandfather. Sometime between 1875-1920 he was a board member for a bank in Columbia PA. Lost in time are the specifics as per which of five banks of Columbia PA. Know that our family will be pleased if someone from the historical society can help us define more specifics about this our early relative. Andrew Garber Nissley (1853-1926) and Barbara Hess (Bomberger) Nissley (1854-1928). Lived at 1219 Garfield Road, Mount Joy PA. Farming couple. Six children. Hi! Please contact the museum at (717) 684-2894 or (717) 572-7149. Someone on staff may be able to provide you with more information. Hi! Please contact the museum at (717) 684-2894 or (717) 572-7149. Someone on staff may be able to answer your question. Best wishes and sorry for the delayed response!